Six pieces of Marklin 7045 Universal Remote Switches. HO scale. Previously owned with unknown usage. Estate purchase. 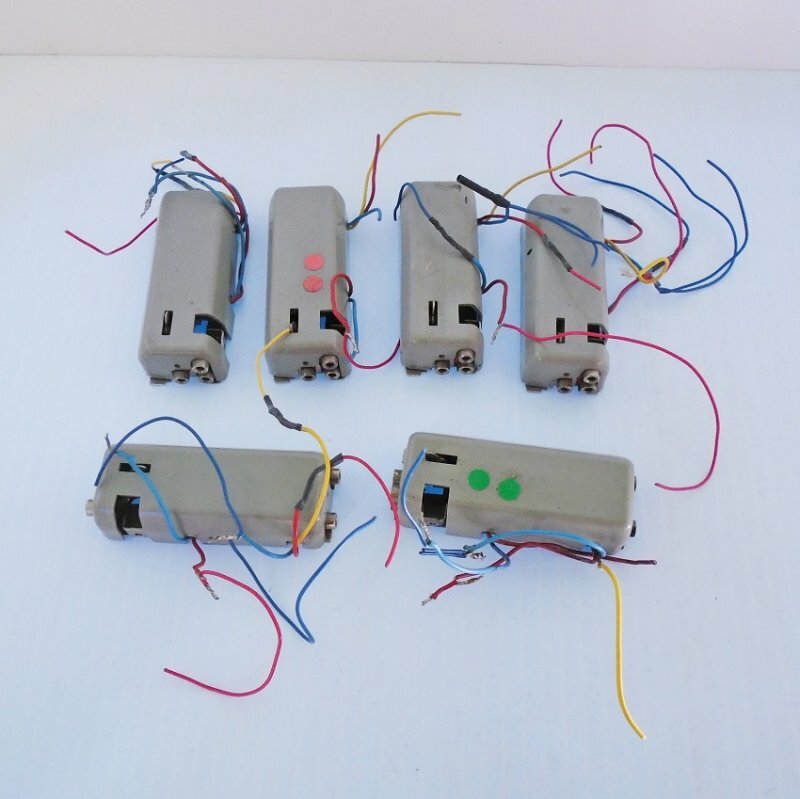 This listing is for 6 pre-owned Marklin 7045 universal remote switches. Please read below for condition. I've never dealt with train parts before, so I've been doing quite a bit of research. None of these 6 switches have a part number on them. I found several pictures of Marklin number 7045 and these switches that I'm offering appear to be the same switch. Looking at my photo, you'll see that the switches still have wires attached. I see no breakage or cracks in the lights. There is one switch that has what I believe is dried glue on the bottom plate. They measure about 2.75 inches long. There are no boxes or instructions. Unfortunately, I have no way to test the parts so these switches are BEING SOLD "AS-IS". However, when I received the pieces, each one was carefully wrapped in tissue and then wrapped again in a small piece of bubble wrap. Seeing that, I can tell who ever packed them away took cautious steps and great care in protecting them. Delivery will be via USPS Priority Mail. Due to the weight, shipping will probably be via postal Flat Rate Parcel, but if you live in or near California regular Priority Mail may be of a lesser cost. If so, I'll issue a partial refund for overpayment. Buyer to pay $7.99 delivery charges. If you would like to send me your zipcode, I can give you an exact quote. I gladly combine shipping on multiple items purchased as long as all items can safely fit in to a single package. It is best if possible to contact me first to let me know which items you'll be purchasing so that I can adjust the shipping charges, otherwise at checkout you will be charged the full shipping fee for each item. Should that happen, and if appropriate to do so, I refund a portion of those charges. NOTE - With this year's postal increase, all shipping charges increased and international shipping took a tremendous leap. International shipping will now depend on the country. Buyer must contact seller for international shipping charges before making a purchase. Seller reserves the right to void any international transactions where contact has not been made prior to purchasing. Six pieces of Marklin 7045 Universal Remote Switches. HO scale. Previously owned. Estate purchase.